By Katía Truijen, December 6, 2014 at 10:07 pm . Silvio Lorusso is an artist and desiger and PhD Candidate in Design Sciences at Iuav University of Venice. He investigates experimental publishing informed by digital technology and has created the Post-Digital Publishing Archive. During the Digital Publishing Showcase, Lorusso presented an overview of speculative strategies and best practices of experimental digital publishing. 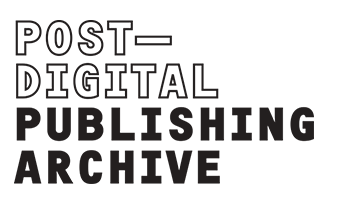 The Post-Digital Publishing Archive is a research and curatorial platform aimed at systematically collecting, organizing and keeping trace of experiences in the fields of art and design that explore the relationships between publishing and digital technology. 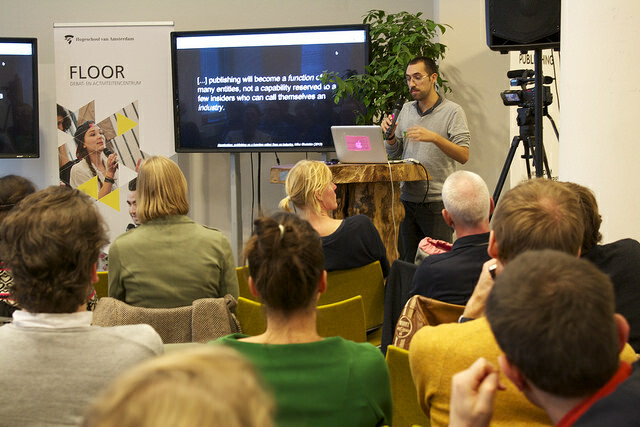 Lorusso explains that experimental practices emerge in the fields of critical and speculative design, critical making, e-literature, artists books and digital humanities. The critical design project The DRM Chair by Les Sugus for example, has only a limited number of use (8 times) before it self-destructs. The project refers to digital rights management, a system that is often used for digital books to prevent unlimited sharing. Projects like the DRM Chair expose the inner workings of (digital) systems. Lorusso explains that according to Mike Shatzkin, digital publishing has becomes a function instead of an industry. Some artists and designers play with this idea. James Bridle for example automatically generated the publication My Life in Tweets that simply contains all his tweets of two years. Another example is FOMO by Space Caviar, a selfgenerated magazine that contains social media interactions based on a hashtag. Lorusso wonders how we would characterize digital publishing if we understand it as merely a function. How can we escape a generic service model? And how to take advantage of the opportunities that digital publishing allows for? ‘If digital publishing is indeed a function, let’s actually perform this function’, he states. Why not playing with the tools that we are already familiar with? Lorusso argues that not many people are aware of the fact that Microsoft Word is not so much a software product, but it can actually be understood as a language. Microsoft Word 2008 even has an ‘AutoSummarize’ 10-sentence function that examines the document and ‘picks the sentences most relevant to the main theme’. Lorusso refers to the project of Jason Huff, who has summarized the 100 most downloaded free books including Metamorphosis and the Illiad. It’s interesting to ask who would be the author of this book. Is it Kafka? Microsoft Word? Or Jason Huff? There are more artists that reflect on the tools that are used for publishing. 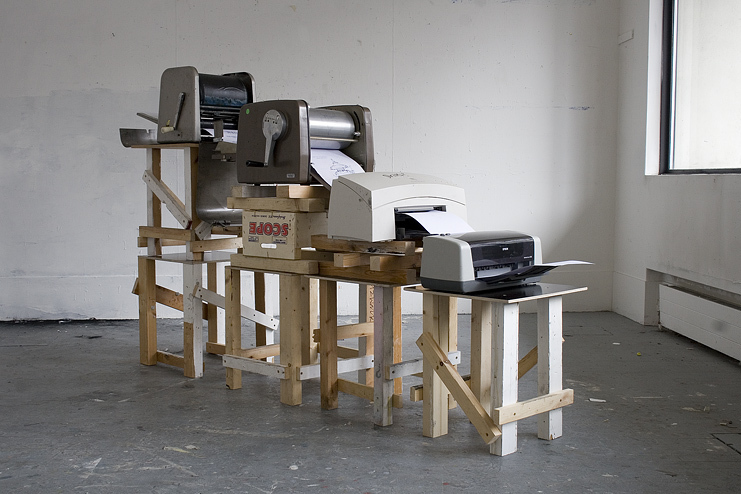 Xavier Antin for example has created an installation that consists of four printers from different periods in time that all print one colour. By letting the tools express themselves it shows that tools are never neutral. They all bring their own constrains, systems and aesthetics. Lorusso argues that because of digital technologies and software, there has been a paradigm shift in publishing from creating to curating. Kenneth Goldsmith explains this process in his book Uncreative Writing. It explores how techniques like word processing, databasing and intensive programming have influenced the act of writing. More and more artists and designers experiment with publishing through collecting and filtering. Roger Ebert for example has created The Collected Wikipedia Edits by publishing all edits by Wikipedians on specific articles. A rather hilarious example is Working On My Novel by Cory Arcangel, who has created a book with tweets that include “working on my novel”. Interestingly enough Penguin has actually published the book. According to Lorusso it shows that these kind of strategies are becoming more and more mainstream. The issue with digital publishing is often that it requires a lot of labour to do it well and to make it work for every single format. This way compromises must be made in terms of functionality. The examples of Lorusso show that many artists play with existing formats by taking advantage of their specific features. By exposing these features through art and design, we may create a better understanding of what digital publishing will look like in the (near) future. More speculative strategies can be found in the Post-Digital Publishing Archive.